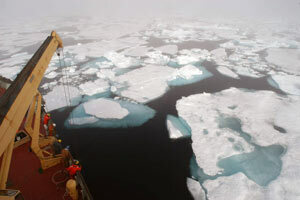 Research in the Beaufort Gyre in 2005. Photo by Crhis Linder, WHOI. Most everyone knows that the Arctic is located at the top of the planet and home to the north pole. But did you know the average winter temperature is minus 30 degrees Fahrenheit, and during summer, the temperature can climb to plus 50 degrees? That the Arctic is the only place polar bears live? And the Titanic struck an iceberg from the Arctic? Discover what else you would encounter in the Arctic.